Q. How do I set up a personal account in an EBSCO database? When you are in an EBSCO database, look in the upper-right corner of the screen to see the options. You can choose any username and password you want. EBSCO accounts are not associated with Walden University. This is a completely individual account you are creating with EBSCO to use their folder feature in their databases. 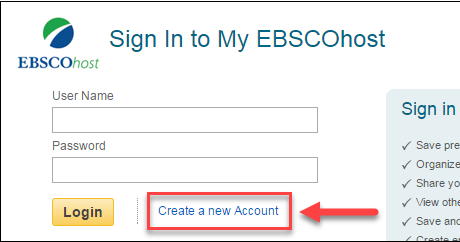 Whenever you enter any EBSCO database, before you add to your folder, you will need to login first. The folder will work the same across all databases from EBSCO. The EBSCO account folder is not accessible from non-EBSCO databases. If you would like to keep lists of articles you find across different types of databases, regardless of which company owns them, you might be interested in citation management software such as Zotero. Learn more about Zotero. Learn how to save an article as a PDF. Learn how to save an HTML article. Learn how to download Zotero.